than one who sought a thing he loved. That’s the central theme of the 1983 film, Eddie and The Cruisers. I remember this movie as being part of my favorite era of movies shown on HBO, along with forgotten classics like Kidco, The Outsiders, Curse of The Pink Panther, Mr. Mom, The Toy, Tootsie, and many many more. Just as Frank Ridgeway is instantly transported back to 1964 when he hears an Eddie look-a-like performing “On The Dark Side” at a club in 1983… when I hear it I’m taken straight back to 1984 at age 6, sitting in our den wondering if Eddie could still be alive. 3. Eddie could have been horribly disfigured and decided to spend the rest of his life in a recording studio, masterminding other people’s music. What this tells me is that the theme of the film went right by Ebert’s head. He was looking for interesting plot twists and bombshells. The fact that there is no payoff is a central component of the narrative. It does not really matter whether Eddie is alive or dead. What we see in the film is how the characters haven’t changed. Sal is as bitter and envious as he was in 1964. Doc is still a conniving dreamer looking for an angle on a big score. Joann is still attractive, sentimental and gullible. Frank is still a mild mannered, romantic, preppy poet. We also get to see how the retrospective on Eddie and the possibility that he could be alive awakens their old ambitions and dreams. 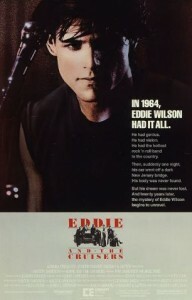 Eddie and The Cruisers is a terrific film. Just don’t go looking for clever plot twists or elaborate storylines. Watch it to see how people don’t change. Ride along with The Cruisers as they relive their youthful dreams, and in the process lead us to re-awaken some of our own.